Happy August! I realize I am almost a week late for that... life's been a little crazy... being married, taking care of three dogs, being a homeowner, interning, blogging, classes- there is a lot going on. Because I am so busy, I have had to smarten up about planning. Particularly for shopping and cooking. My husband is on a gluten free diet which limits the options for quick dinners. Also, we generally prefer and enjoy eating homemade, healthy food. In order to accomplish this along with our busy schedules, I have become rather good at meal planning. It is so easy to come home from a long day at school or work and just opt to go out, eat something frozen or just snack on junk instead of eating a good healthy meal. It is very tempting to me to do that if I have not planned and shopped accordingly. Meal planning ensures that I have a well stocked kitchen, a predetermined plan for what we will eat each day and eliminates the "what do you want to eat" discussion that can be never ending. Meal planning is not too difficult. On Sunday, I sit down with my recipes and a notepad and I make up a shopping list and what we will eat for the week. I try to change it up so we have a varied diet and keep the dinners from getting repetitive. Here is my meal planning process and a sample of what my meal plan was for this week. I start this process by deciding on recipes for the week. I usually cook 3 full dinners and we have leftovers or go out the other nights. We also have homemade pizza every Friday (when we got engaged I decided we needed to start some traditions so we have pizza and watch a movie every Friday we are free). I have a whole binder with all my recipes so I usually sit down with that and if nothing looks good, I turn to pinterest. There are so many great bloggers out there sharing recipes and I can also find some new favorites. I tend to pick recipes that can share some ingredients like two include chicken or carrots in all to save money and use all of my ingredients that I purchase/have on hand. 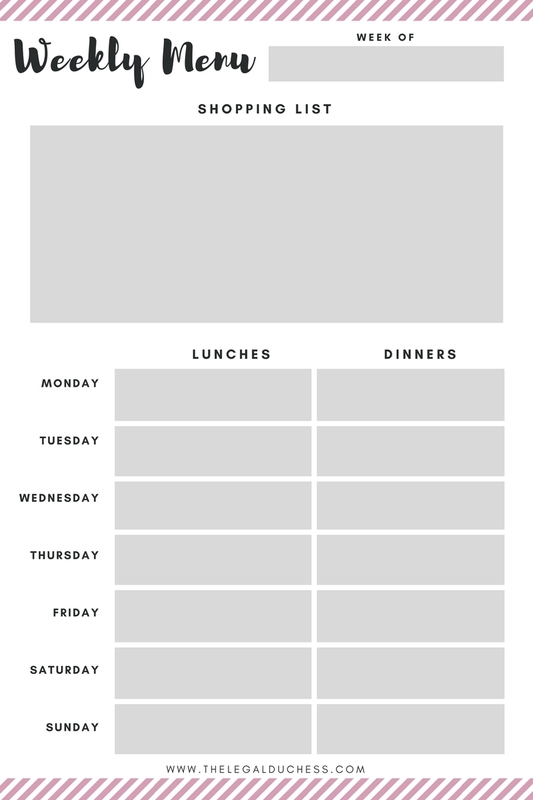 I fill everything out on my weekly menu planning sheet. I am offering this as a free printable for my readers! I do my grocery shopping on Sundays usually so it is done for the week and something I don't have to fit into my busy weekdays. Next, I add all ingredients not already in my pantry to my grocery list. This is a great time to take inventory, throw away expired items and see if I m getting low on something. After I have my ingredients on the list, I start adding all the other basics: breakfast food, lunch stuff, snacks and any other random necessities. My husband and I both pack our lunches every day so it is best to have everything on hand and ready to throw together the night before. Some weeks I plan on salad every day for lunch so I get salad fixings. Other weeks I make bigger dinners and take leftovers into work for lunch. Sometimes we keep it simple with sandwiches and snacks for lunch. Once my list is complete, I look for coupons and deals. I use the Flipp app for finding the best deals at my local grocery stores as well as coupons. I also have the Kroger app downloaded because I can search coupons and load them digitally on my Kroger card and I never even have to clip coupons while still getting all the savings. I also use the Ibotta app- this app provides rebates for everyday grocery items by simply unlocking the rebate with a quick survey question or watching a quick video and then scanning your receipts. I can get $2-3 per shopping trip thanks to Ibotta rebates and it only takes a few seconds. I have been using Ibotta for about 2 years and I have received over $100 in rebate money that I redeem for gift cards to a variety of locations including Target and Amazon- all that just from grocery shopping! If you want to sign up for Ibotta (and I highly suggest you do) and make some money simply by doing you normal grocery shopping, use my referral code when you get started and get $10 added to your account free! : sjegoep. I am obsessed with Ibotta! When I am done grocery shopping, I put away all my groceries and prep a few things. If I bought a package of chicken breasts and I am using them in separate recipes, I go ahead and separate them into freezer safe baggies in the portions I will use for each recipe. Some of the lunch snacks I buy, I go ahead and pack them into lunch portions in snack size baggies so when packing our lunches, I can just grab them and throw them in the lunch box. I try to organize my pantry and fridge as I put things away: Mondays ingredients closer to the front and Friday's ingredients closer to the back. On the day to day, I do not have to waste time trying to decide what to cook, picking up last minute items or searching the pantry for something to throw in my lunch box. I did the work early on so that I have all ingredients, a plan for the week and enough food without wasting. I can cook dinner quickly and efficiently when I arrive home; I have time to cook good dinners because I have done all the prepping, shopping and planning previously. My ingredients are chosen so that I can use them in multiple recipes if there is some leftover so I hardly ever throw away half an unused onion or the other half of already used ingredients. For lunches, I have everything planned out and ready to just place into the respective lunch boxes and throw in the fridge before bed. Sometimes it's leftovers, sometimes it's sandwiches but either way I have everything I need to pack the night before and be ready to just grab and go in the morning. Our breakfast foods are available and ready to go so we can start our days fueled and ready to go: I often cook a big crockpot of oatmeal on Sunday and keep it in tupperware in the fridge. Then each morning I simply fill a bowl, heat it up and breakfast is done! I like to add banana pieces or blueberries to my oatmeal to spice it up. Other weeks I have a package of English muffins and have one with jam each morning. Here is a sample of our weekly menu plan. I typed it out so no one had to suffer my chicken scratch writing lol! As you can see, I have repeated ingredients so that I don't waste anything. I use rice in two dinners, broccoli in three dinners, chicken in three dinners, I use marinara in both the lasagna and on the homemade pizza, ground beef goes into lasagna and hamburgers. We eat leftovers so that is less time cooking, easy lunchs and less food thrown away which is a win-win-win in my book. The more items I can reuse/use more than once, the less I waste and throw away which means more bang for my buck! Our lunch snacks become day snacks on the weekends and we try to avoid sweets and the easiest way to do that is to just not buy them (however I am notorious for baking when I am stressed so we usually have cookies or brownies laying around). My recipes are all pretty simple, well loved and come from family (at my bridal shower I asked for a favorite recipe in lieu of cards and I have quite a great selection!). 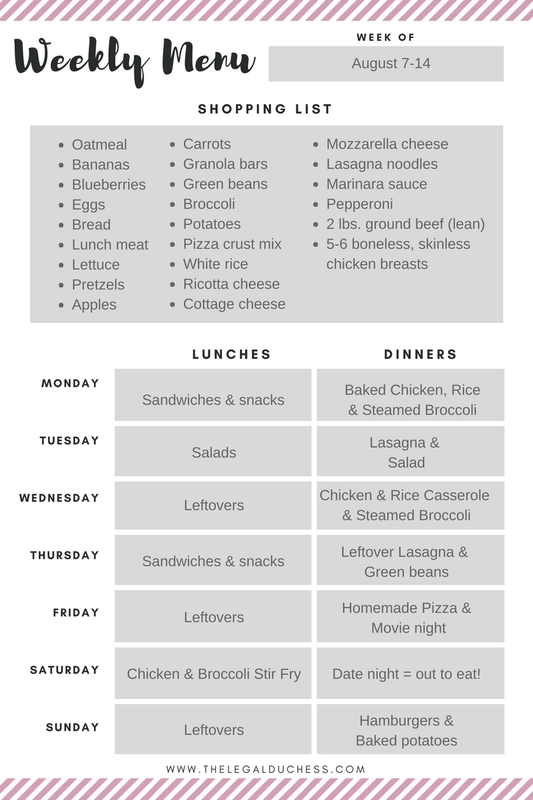 I follow this plan pretty closely throughout the week and everything goes very smoothly in my kitchen as a result. You may have to force yourself the first few times and you may struggle to decide on recipes ahead of time but once it becomes a habit, you will not know how you ever lived without it. Having a recipe box or binder is a great way to make meal planning easier. In the beginning, you may be pulling recipes of Pinterest and there will be winners that you love and some that are so-so. Print out the good ones and start a binder so that after a while, you have a binder full of recipes you love to consult when meal planning. If you think you can remember everything, you must be way smarter than me. I absolutely have to write my meal plan and shopping list down. I put it right on the fridge each week and I know what I am doing for the rest of the week. Crockpots are fantastic for meal planning. I use them so often during school because I can just arrive home, stir the crockpot and serve dinner. Crockpot meals are great for meal planning because they are usually easy to prep (dump various ingredients in the crockpot- may involve some chopping of veggies) and make great lunch leftovers. Invest in a crockpot- they are 100% worth in. I meal plan to make my life easier, to save money and to ensure that we are making healthy food choices even when life gets busy. There really is no downside to meal planning except for the occasional evening where the planned dinner just doesn't sound good. Thankfully those times are few and far between because thanks to meal planning, I am able to vary our diet and change up the recipes weekly so that we are not just falling back on the same 3-4 recipes that are quick and easy week after week (which happens if I do not meal plan). 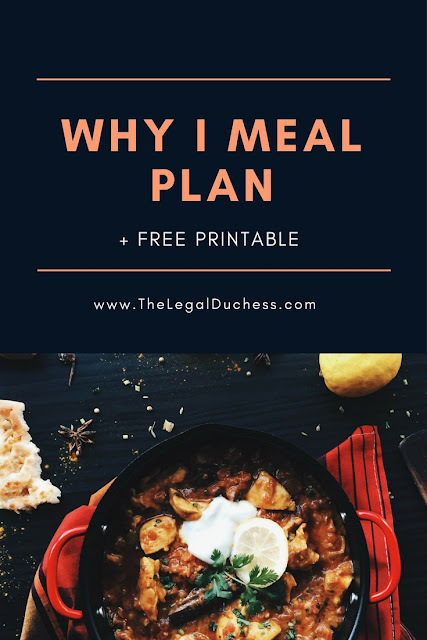 Meal planning is absolutely a lifesaver in my busy life and I cannot recommend it enough!